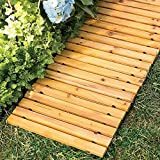 Whether you are working in the garden need a decorative pathway over a muddy spot in your lawn, or just want to get boxes up off the floor in a damp basement, these cool new Wooden Walkways are a handy solution. 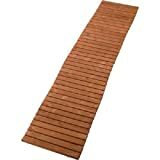 These portable wooden pathways for your lawn and garden roll out when needed and roll back up for easy storage when not. They feature a flexible design that conforms to the ground and come in either straight or curved versions to help you create a walkway through or around any obstacle in your landscape.